In 1924, Josh Powell purchased a small plot of land on 30th Street in Independence Heights, Texas for $10. At the time, Independence Heights was the only incorporated African American municipality in Texas. The town covered less than four square miles but contained hundreds of small wood-framed houses, a school, five churches, and approximately 40 Black-owned businesses. Thanks to Black contractors who lived in the area, Independence Heights had paved streets, plank sidewalks, and its own municipal water system. Ninety-five years later, Powell’s great-granddaughter, Tanya Debose, is fighting to keep Independence Heights above water and her ancestor’s memory alive. “When he bought his house, what that meant was because he owned land he could hold office,” said Debose, who now leads the Independence Heights Redevelopment Council. With property ownership came power, and that legacy remains to this day. According to Debose, all 5,000 households in Independence Heights voted in the 2016 elections. Debose never saw the original family home. Houston annexed Independence Heights in 1929, and the Powell property was lost to a major highway expansion project in 1959. The area saw mass disinvestment from the 1970s through the 1990s, while the Houston suburbs grew at breakneck speed, sealing off most of the ground with concrete in the process. Combine that with steadily worsening weather disasters and it’s little surprise the neighborhood has flooded three times in the past four years. The aftermath of buyouts in Independence Heights, Texas. Once a property is bought out in Houston, it belongs to the county flood control district and must remain vacant in perpetuity. Photo by Laura Thompson. In 2017, Hurricane Harvey dumped more than 30 inches of rain on Houston, which caused the bayou in Independence Heights to flood. To make matters worse, the highway acted as a de facto dam, trapping floodwater in the neighborhood. Approximately 65 percent of Independence Heights homes were damaged by the storm. If mother nature is the rock, the local government is the hard place. The county's proposed solution to the problem is a sweeping home buyout program, which community leaders vehemently oppose. Some see it as an attempt to save wealthy (predominately white) neighborhoods in Houston by sacrificing a historic community of color. Disaster-related buyouts are considered a last resort for homes “hopelessly deep” in the floodplain. Once a property is bought out, all structures are razed and the land is “returned to nature.” It’s a colorblind strategy, but its effects are anything but in historic Black towns. Though there are exceptions, many historic Black towns can be found in low-lying, swampy areas, because that’s what was available to African Americans in the Jim Crow South. In Independence Heights, Little White Oak Bayou runs along the neighborhood’s western edge; Princeville, North Carolina, the first town in America chartered by freed slaves, sits on the low side of the Tar River; Grambling, Louisiana, home to the historically Black college Grambling State University, was built atop underground springs. All three contain large swaths of land within the 100-year floodplain. Consequently, all are potentially eligible for buyouts. A tax appraisal of Josh Powell’s home in Independence Heights, Texas. Date unknown. Courtesy of the Harris County Archives. Local authorities use a cost-benefit analysis to determine which low-lying properties to buy out. Homeowners are supposed to be offered a fair market price for their homes, plus moving expenses and other incentives for low- to middle-income families. Basically, if a home’s tax assessment is lower than what it would cost to improve drainage, elevate the foundation, or any other fix, it’s targeted for buyouts. Amanda Martin, a Ph.D. candidate in the University of North Carolina’s City and Regional Planning Department, said it’s important to remember that property ownership has always been a racialized subject in America. Even today, home values are affected by a neighborhood’s racial makeup. African-American communities, regardless of historic designations, are often targeted for buyouts simply because their property values are lower. 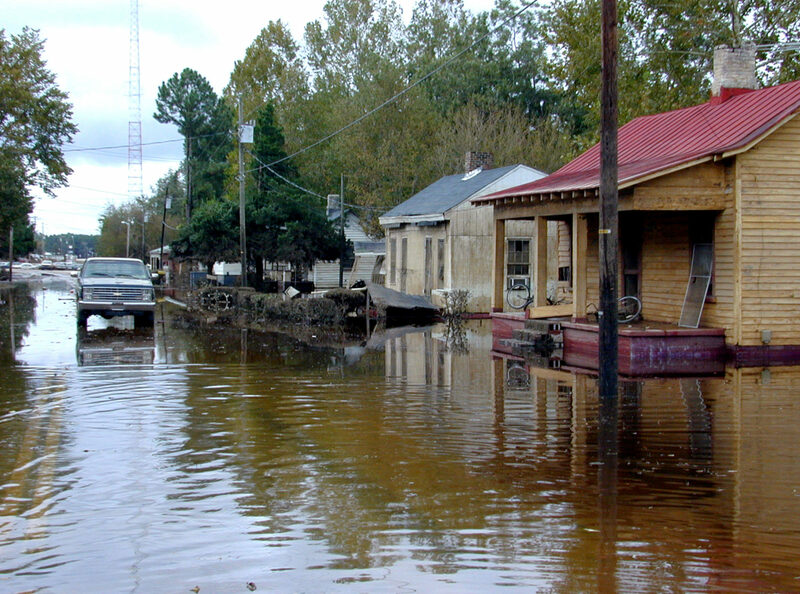 The racialized inequality underpinning the buyout controversy is especially visible in Princeville, where flooding has marred the community for centuries. After several major floods in the early twentieth century, the U.S. Army Corps of Engineers (USACE) built a levee between Princeville and the Tar River in 1967. In 1999, Hurricane Floyd brought down enough rain for the levee to overflow, and the town flooded with up to 20 feet of water for 11 days. One thousand homes were damaged or destroyed. Residents seriously considered a mass buyout offer in the wake of Hurricane Floyd, but decided instead to rebuild; the levee was supposed to protect the town from a once-in-300-years flood. In 2016, just a few months before Hurricane Matthew drenched the town again, a study by the USACE found the levee was never up to snuff to begin with. Down river, a majority of residents in the predominantly Black community of Kinston took buyouts and moved away. But Princeville has doubled down on preserving its history. At the heart of the issue is the continued devaluation, and even erasure, of Black communities. Princeville and other Black towns have been fighting for their right to exist since their founding. More than 1,200 Black settlements were established between the late eighteenth and early twentieth centuries, but Bobbie Jones estimates only 100 or so remain. So much Black history has already been lost, and he can’t fathom surrendering any more of it to buyouts. The 1928 tax appraisal for Josh Powell’s home in Independence Heights, Texas. Courtesy of the Harris County Archives. In Grambling, Mayor Ed Jones said lack of state and federal dollars is part of what makes these towns so difficult to preserve. Flooding just makes a bad situation worse. The phenomenon Ed Jones describes is known as deferred maintenance, and it often precludes homeowners from utilizing flood mitigation strategies like elevating a building’s foundation. Demolition is typically the only option, through buyout or reconstruction programs. Beyond the damage to buildings, Martin’s research has found that buyouts can erode the social ties and community support that are so vital to historically marginalized communities. For example, families that move away could lose the network of neighbors they previously relied on for free or low-cost childcare. In Houston, where public transit is limited, those who take buyouts and move to the more affordable suburbs may now struggle to make it to work. In historic Black towns like Princeville, values like property ownership and community network are paramount. They were founded as places were African Americans could own their own land, run their own businesses, and protect their own people from an otherwise hostile society. Though buyouts may benefit some individual homeowners, they threaten to wipe out entire towns and erase the unique history of Black survival that those towns represent. For the moment, most residents of Princeville, Grambling, and Independent Heights are keeping buyout offers at bay. Bobbie Jones said a handful of Princeville households have taken buyouts after Hurricane Matthew, while the rest elevate their homes or wait for the levee to be brought up to standard. The town was more or less spared by 2018’s Hurricane Florence. In December, Louisiana launched a statewide buyout program that’s targeting approximately 500 flood-prone houses. Grambling Mayor Ed Jones said he’s heard no talk of buyouts in his town, possibly because the university took the brunt of the damage from the March 2016 floods. Nearly three years later, flood restoration projects are still ongoing. Since 2002, residents of Independence Heights have only taken about a dozen flood-related buyouts. After 2017’s Hurricane Harvey, the community partnered with CITGO Petroleum Corporation on a disaster relief initiative. CITGO has pledged $6 million to rebuild 300 homes in Independence Heights over the next three years. Post-Harvey buyouts are still being processed, but Debose and her constituents continue to resist.